Borders Does A Price Bait And Switch! So I went and looked at the link. Let me tell you how tempted I was. I went and displayed local store inventories. I figured maybe I’d hop into Manhattan and pick one up. 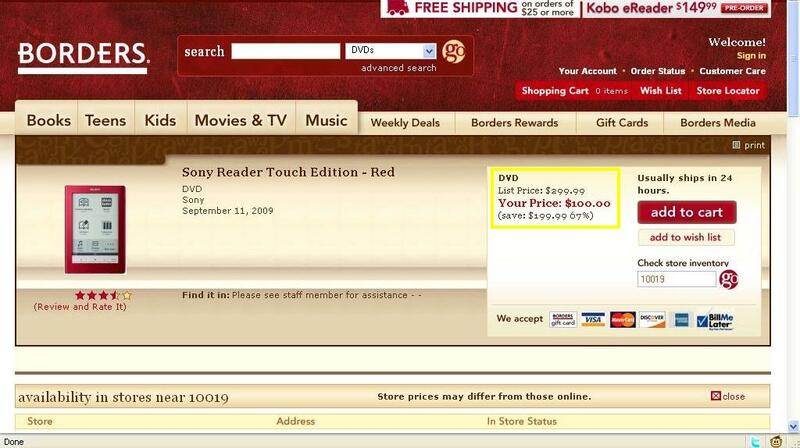 Yes, I despise eInk, but this is a frikkin touchscreen Sony Reader for just $100 — and red too! Well, I retweeted the news and within an hour, people were reporting that their attempts to buy this resulted in the price mysteriously doubling when it got to Checkout! See, this is why I absolutely hate “web specials” and think they should be outlawed. If a physical store tried this, the state Attorney General and consumer protection agencies would jump on them. TV news would have footage of people complaining. The store would suffer humiliation. But the main reason to ban these things is this: They attract speculators who buy them up with the sole purpose of selling on eBay. Also, with physical stores, there’s an on-site inventory. When that’s gone, the sale is over. With a web special, who knows how many are really in the pipeline? If they have only 300 and 1,000 people order, when do the 700 “losers” find out? Website specials create havoc, disappoint people, and bring the greedy out to prey. 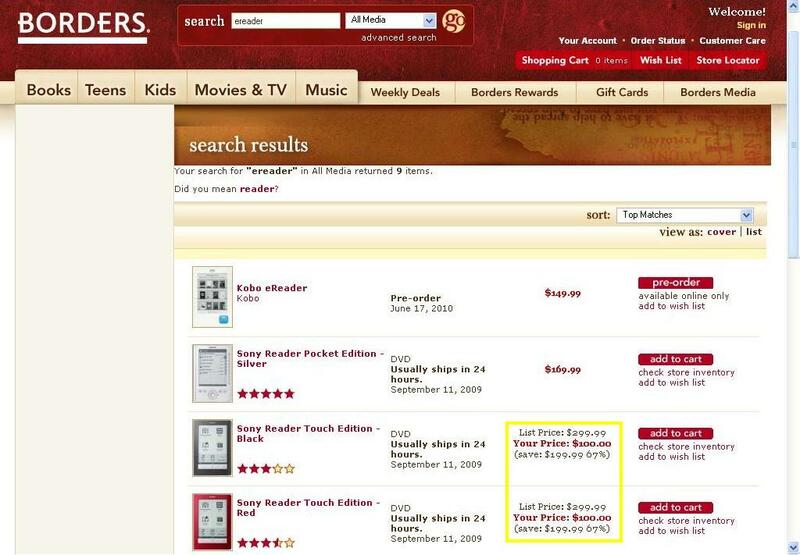 And Borders, you should honor every single one of those purchases that began with the page showing a $100.00 price! This is your mistake — if it was that — now eat the loss! This entry was posted in eCrap ePub eBooks. Bookmark the permalink. I was able to pick one up for $100 shortly after I retweeted the deal this morning. Checked the order and it still has $100 listed as the price. I’ll let you guys know if that changes (if so I’ll cancel the order). Good luck with that if it happens, Borders’ policies don’t allow cancellation. You can return, at your own cost – but not cancel. Have to do it as a charge dispute. I would dispute the charge. You now have these screensnaps to clearly show they pulled a bait and switch on that price. People got locked into *double* the price shown without any way to get out of it! Yeah, I’m going to dispute. I obviously could have cancelled – but I’d been hitting submit so often with the “technical difficulties” they were pleading I hit it again before I processed what they’d done. It would have never occurred to me they’d change the price of something IN the cart with no more explanation or warning than just the numbers. Between the purchase email stating the price, the screencaps and a big brew-hah-hah on Twitter, it’d think getting my money back would be an easy process. To be doubly sure I put the order on a credit card so I can always dispute the charges with them if Borders were to try and screw me. And woe be unto them if they do. sure … 100$ ebook reader .. dream on. There is already a $100 *color* eBook reader for sale in the U.S. I should have done a post about that. Maybe I will. I won’t be trying to buy anything *there* any more. That’s MY right. Just got my cancellation email as well. Said that the price was “in error” and they are sending a $25 gift cert instead. Bleh. Not much help as I don’t ever shop at Border’s.